The Hound of the Baskervilles is a British TV mini-series of 4 x 30 minutes episodes. 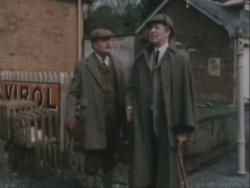 Produced by BBC, directed by Peter Duguid, starring Tom Baker as Sherlock Holmes and Terence Rigby as Dr. Watson. This page was last edited on 9 March 2019, at 21:41.